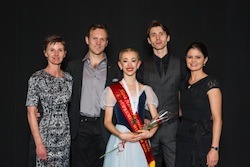 After winning the coveted Gold medal at the 2014 Genee International Ballet Competition in Belgium, Kiwi dancer Vida Polakov is on a roll. 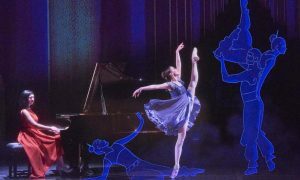 She’s now taken the top spot in the Supreme B category (16 -19 years) at the Alana Haines Awards (AHA) – the Southern Hemisphere’s largest ballet competition, which this year attracted over 400 entrants. Following her win, she travelled to the USA to compete in the Youth America Grand Prix (YAGP) where she was made a very special offer. Currently a student of Sydney’s Tanya Pearson Classical Coaching Academy, this young dancer looks set to have a wonderful career in dance. How did it feel to be announced as the winner of the 2015 Alana Haines Supreme B? Which solo did you enjoy the most and why? How long did you train for the AHA? Vida Polakov performing her contemporary variation. Photo by Amber Griffin Photography. Where in NZ did you train before moving to Tanya Pearson? What is a typical day in Sydney? 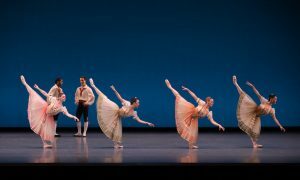 Did you enjoy your trip to the YAGP, and what was it like competing there? Where in the world has your dancing taken you so far? What has been your favourite overseas experience and why? What companies or choreographers would you love to work with? Vida Polakov wins the 2015 Alana Haines Supreme B award. Photo by Amber Griffin Photography. Have you had any injuries? How do you avoid them and stay healthy? What is next for you over the next 12 months? Photo (top): Vida Polakov performing her Giselle variation at the Alana Haines Awards. Photo courtesy of the Alana Haines Awards.